As a city grows, architecture continues to take the form of whimsy and talent while working to fit among its siblings surrounding it. This combination of the artistic value of architecture and the necessities that appear when trying to cram a large number of people into a small area has always made for uniquely weird constructions and the city of Chicago, Illinois stands out with its unique collection of strange towers and mind-blowing space-savers. Nestled on a promontory of Lake Michigan just north of the Chicago River, the Lake Point Tower is a curvy residential building in the Streeterville neighborhood of the city, housing condominiums and some office space. Built by architects John Heinrich and George Schipporeit in 1968, the building’s curvy look was inspired by a design by German Mies van der Rohe for a glass-curtained skyscraper that would have resided in Berlin, though the project never came to be. Also setting Lake Point Tower apart is its location, an area just outside of the downtown core of Chicago, giving it a unique, solitary look along the skyline. While it is likely that the city’s urban core will continue to bring tall buildings closer and closer to it, Lake Point Tower will exist as a structure unto itself for the foreseeable future. 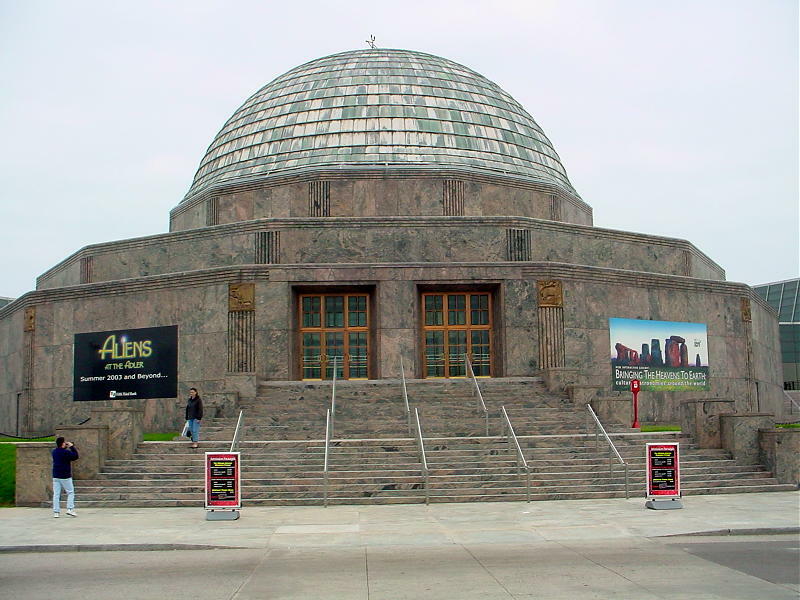 Built in 1930 and situated on the historic Lake Shore Drive, the Adler Planetarium is not only weird in design but also has the scholastic distinction of being one of the first full-featured planetariums to be built in the Western hemisphere. Sporting a solid stone exterior with a customary dome on top, this building and its purpose make it one of the more unique constructions and best-known movie location in the city of Chicago. Also opened to the public in 1930 is the Merchandise Mart, a huge stone building that represented the largest indoor space in the world when it was constructed with more than 4,000,000 square feet of floor space; the building is so large that it had its very own zip code until 2008! Dubbed the “merch mart” by locals, this enormous testament to humankind’s construction abilities served and continues to serve as an office and show space for wholesalers, bringing them all together in Chicago’s Near North Side. Looming like something straight out of George Orwell’s 1984, the John Hancock Center is an ominous-looking skyscraper on Michigan Avenue in Chicago. Tall, dark and dreary in appearance, the building still manages to attract the highest level of tenants, both business and residential, and offers memorable amenities such as the highest indoor swimming pool and skating rink in the United States. With its two rooftop antennas, the John Hancock Center stands a full 459 meters tall, making it the fourth largest in Chicago and the sixth largest in the United States. Built with a unique Gothic Revival style in mind, the Tribune Tower of Chicago resembles a cross between a cathedral and a modern skyscraper, combining different styles of architectural design in order to create a truly weird and unique building. Also unique is the root of the building’s origins, the result of a competition hosted by the Chicago Tribune in order to decide on a design for its new headquarters. Among the many submissions was one by New York architects John Mead Howells and Raymond Hood, the eventual winners of $100,000 and the privilege of designing what remains one of the world’s most interesting structures.